Edgar Allan Poe has become more of a fascinating individual after his death than he was during his lifetime. In fact, Poe was known in his day more as a literary critic than an author, and only after his death at the young age of 40 did he become a Famous Author. 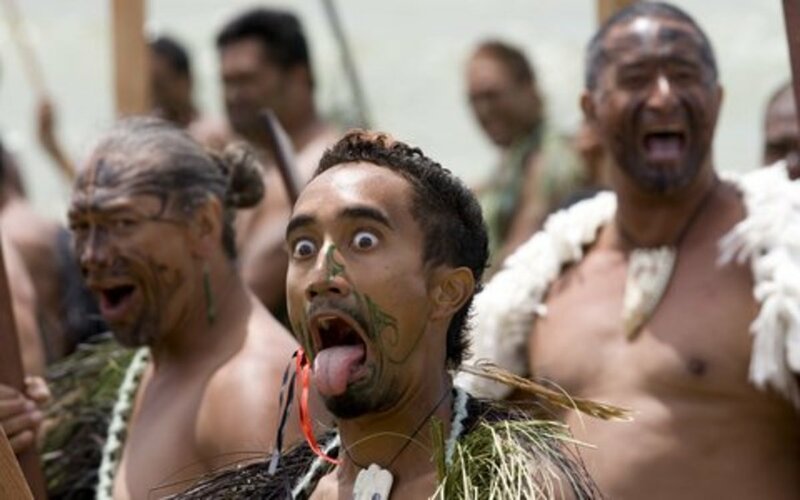 His most popular poems are Gothic in nature, catering to the taste of the general public at the time. 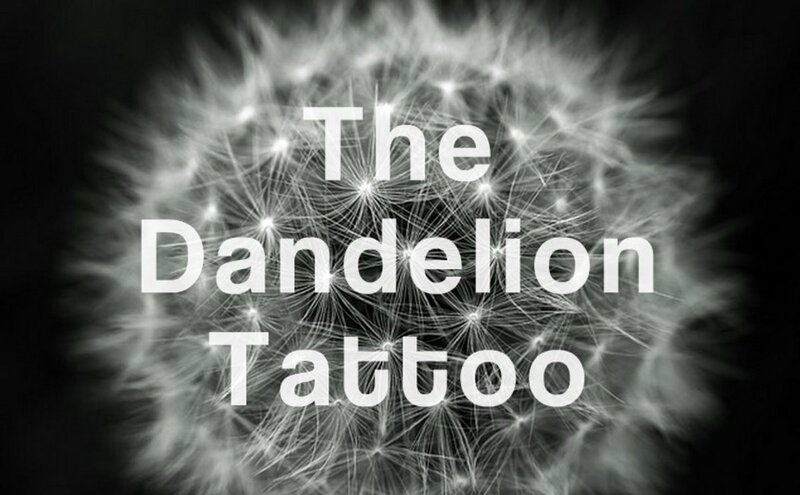 Surprisingly, at least to me, the tattoos celebrating Poe and his works aren't always dark and macabre, although his works often were. 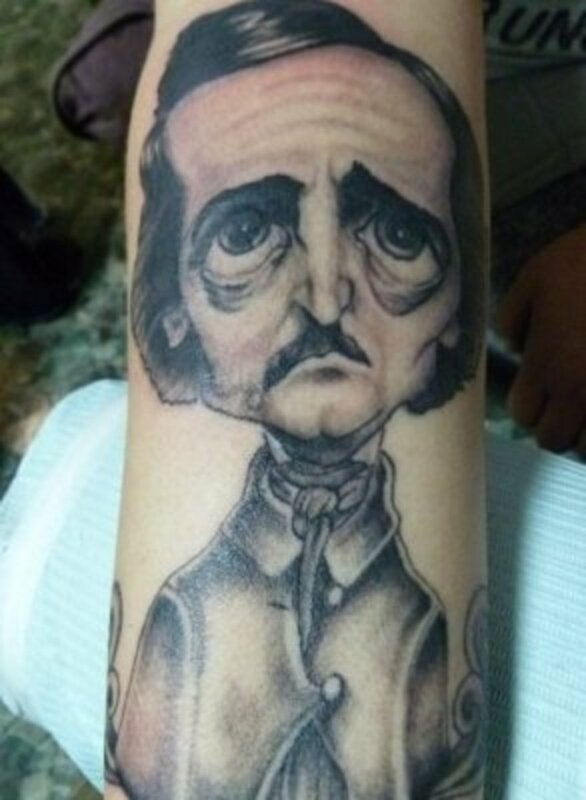 Most of the tattoo designs I see are of Poe himself, and they always seem have a Gothic flourish. 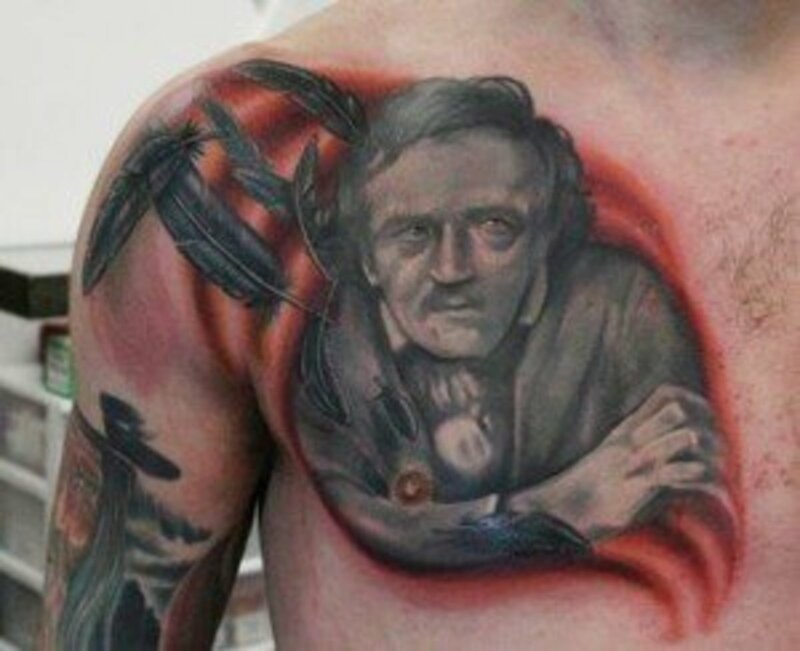 To me, it's too bad there aren't more Gothic Poe tattoos, as his works fall mainly in that genre, as well as in satire, science fiction, and detective themes. 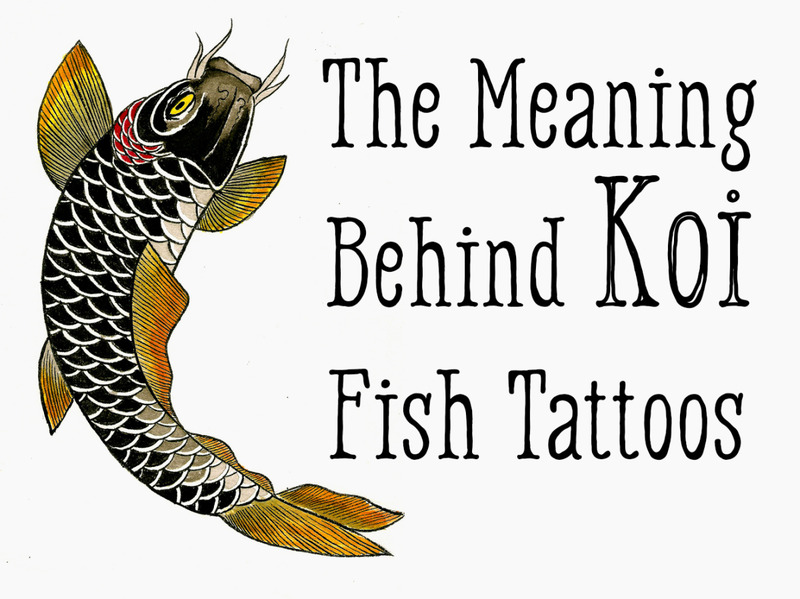 He certainly created some good material to inspire various designs for tattoos. 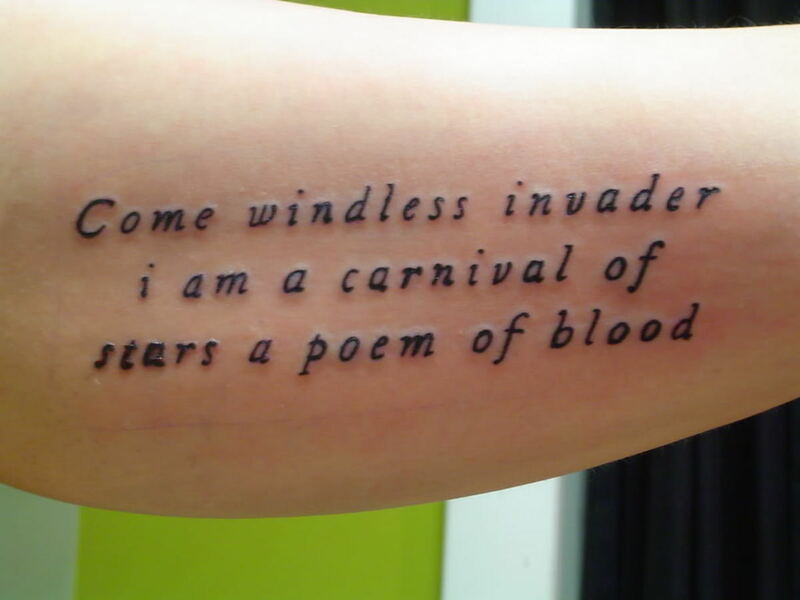 Even so, the words of Poe as tattoos look fantastic, and when used with other designs and props, really stand out well. After all, for most, it's the words of Edgar Allan Poe which had such a strong, lasting effect, not only the images conjured up by them. The majority of tattoos celebrating Edgar Allan Poe or his works, are either portrait tattoos or tattoos of the words he wrote. With this first tattoo, I thought it would be a great idea to show one that was somewhat of a caricature of what Poe looked like, displaying some of the sad and tormented man he apparently was. Poe's life was somewhat shrouded in mystery, but the loss and scandals surrounding his life in fact took a toll on him; one of the reasons his life was so short. This tattoo is a fantastic one in the sense of showing, especially through those saddened eyes, who the man seems to have really been. I like the way the butterfly wings scroll at the ends, giving the appearance of reading it on stationary of some sort. 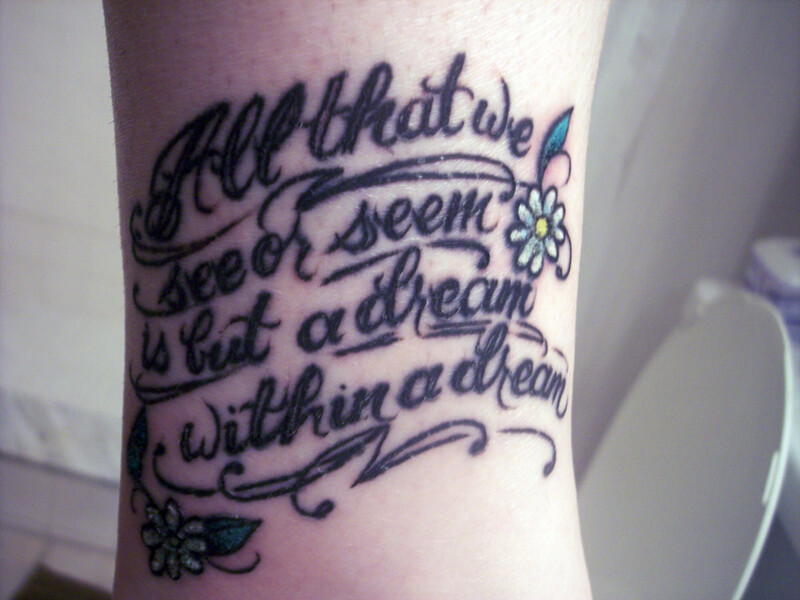 Obviously 'Dream Within a Dream' is one of the more popular poems of Poe, and that is reflected in the choice people make in having his words inked on them. 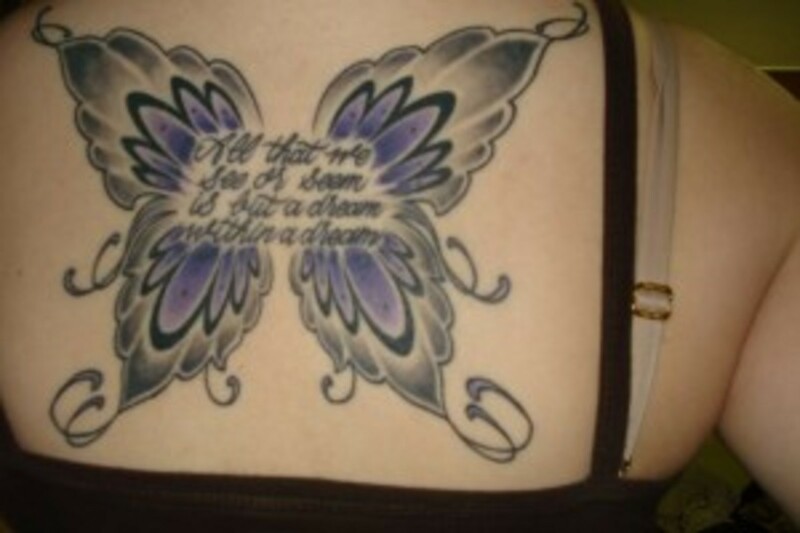 Here's another one with a very different look than the butterfly tattoo above with the poem on it. 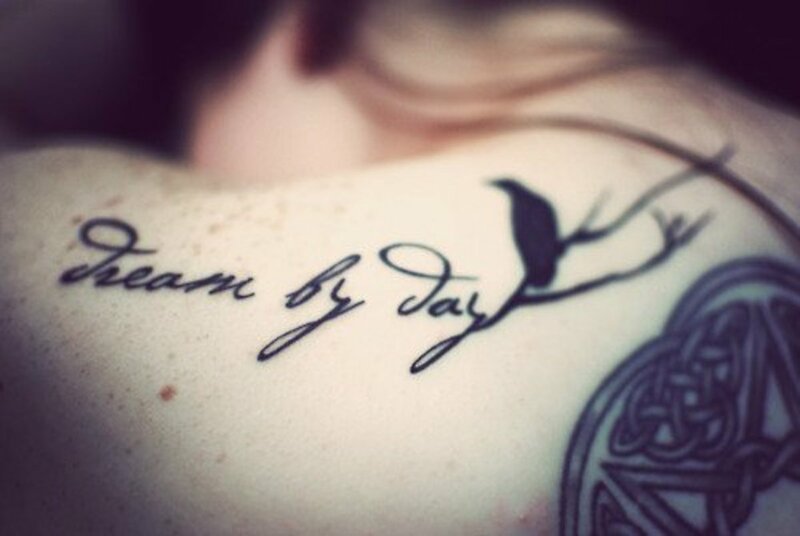 The words of Poe: Dream by Day, are the script of this tattoo, which is fantastic in its look and simplicity. The way the 'Y' scrolls into the branch with the raven sitting on it is awesome to me. 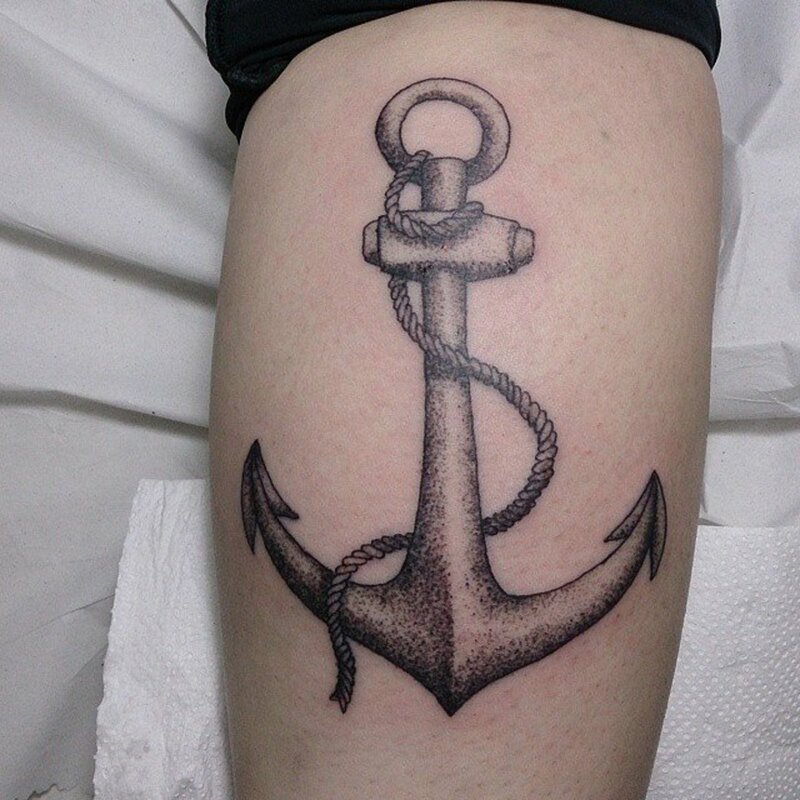 That dark ink makes it stand out awesomely. The choice of the font in this script of Poe's words is perfect. The outstanding depth of the ink and the clarity of the letters and words make this a terrific tattoo design celebrating the works of Poe. 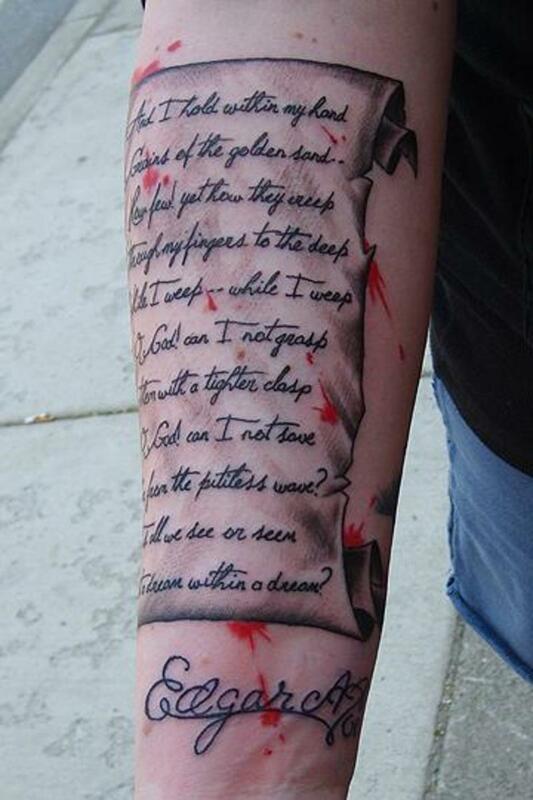 The choice of using a scroll as the backdrop to Poe's poem was a fantastic one with this tattoo. Cursive as part of the font for the script looks really good, and the scroll is really well done. The shadowing especially is very appealing to me. It's a great canvass for worthy words. Rather than include the usual raven as the design associated with Poe, this tattoo artist chose to present the feathers of the raven to present the portrait of Edgar Allan Poe. I think it was a terrific choice. As for the red color surrounding Poe, I think his image would have stood out better without it, although it may have been a nod to the Gothic focus of who he was as a writer. 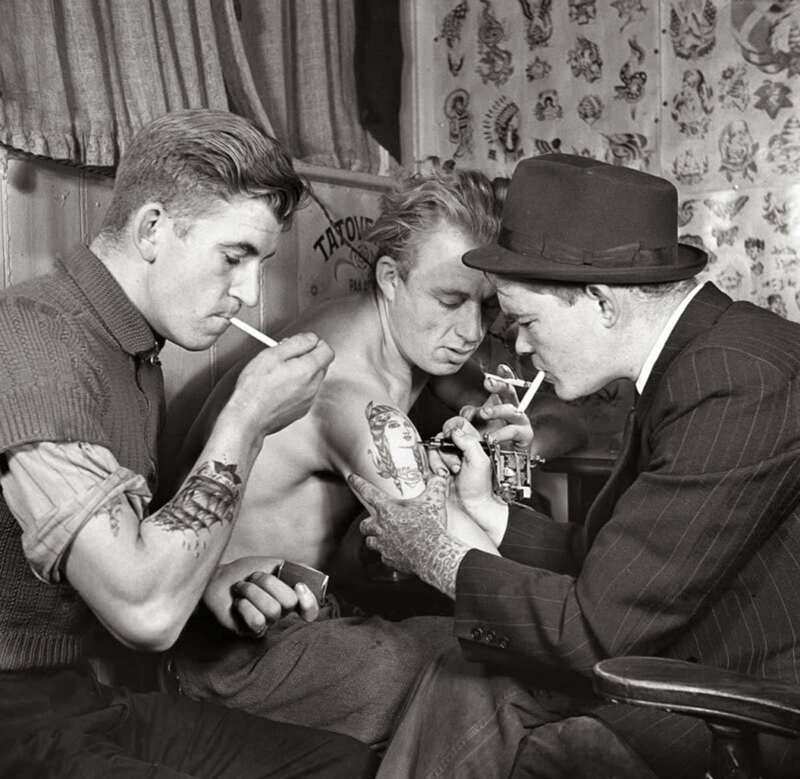 There we complete our brief look at the tattoo Gallery of Edgar Allan Poe and his works. 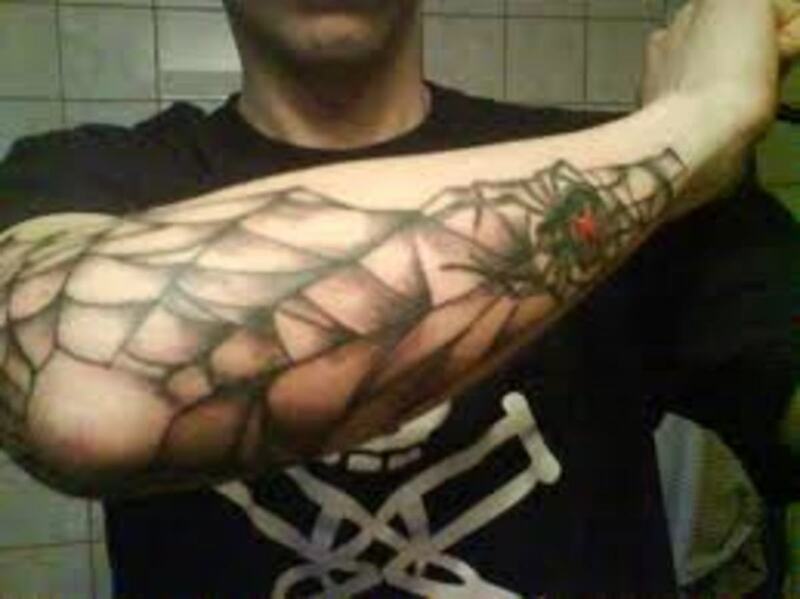 It amazes me how a tattoo artist can take the words of a man and weave them into such a compelling image for all to enjoy. The design and works are combined to create an entirely new interpretation of who Edgar Allan Poe was and what was deep inside him. You can't ask for much more than that. Great hub! I wrote my senior research paper on Edgar Allen Poe.